What if nutrition could help treat memory loss, depression & anxiety? There is a lot of evidence that food that is bad for your body also has negative effects on your brain. Our brains also use food for fuel. White breads, pasta, processed meats and cheeses, and microwave popcorn with nitrites have all been linked to memory loss, cognitive decline, and Alzheimer’s disease. Not only is it the quality of what we eat, it is also the quantity that can affect memory loss. It has been found that overeating doubles the risk of memory loss and cognitive decline as we age. Not only that but the higher the number of calories consumed each day, the higher your risk of mild cognitive impairment. High calorie consumption was those who consumed between 2,143 to 6,000 calories per day. 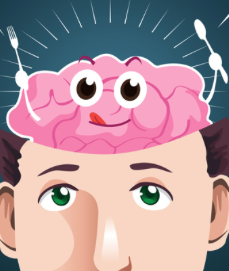 We can eat certain foods that will combat memory loss. Foods that are proven to boost brain health: vegetables like broccoli, cabbage and dark leafy greens, blackberries, blueberries, cherries, oranges, eggs, seafood, coffee and green tea, dark chocolate, turmeric, pumpkin seeds, and walnuts can all preserve memory and reduce cognitive decline. Depression is very common causing quality of life issues for those who experience it. Just recently, a study showed that a diet of whole foods and limited processed foods, sweets and fried foods reduced depressive symptoms in those with moderate to severe depression! Many scientists now agree that food can be a powerful tool in reducing depression. So, what did they eat to reduce symptoms of depression? First, calories were NOT restricted. They ate whole foods like fruits, vegetables, whole grained, lean meats, eggs, fish and olive oil. Sugar, refined cereals, fried foods, fast foods and processed meats were all discouraged. They allowed for two sugar-sweetened beverages per week and two alcoholic beverages per day, preferably red wine. With anxiety topping the list as one of the most common mental illnesses, many people struggle with anxiety on a daily basis. And according to the Harvard Medical School, by eating a balanced diet, drinking enough water, limiting and/or by avoiding alcohol and caffeine we can relieve anxiety! There are even specific foods that have been shown to reduce anxiety: oysters, cashews, egg yolks, lean beef, liver, fatty fish, pickles, beans, fruits, berries, walnuts, spinach, kale, asparagus, avocados, and almonds all have been shown to reduce symptoms of anxiety. The evidence is mounting so why not give it a try? If you or a family member is concerned with or dealing with memory loss, depression or anxiety there are things you can eat to help relieve your symptoms. We are not only fueling our bodies, we are fueling our brains too!